Nikolay Mikhailovich Shvernik (Russian: Никола́й Миха́йлович Шве́рник, 19 May [O.S. 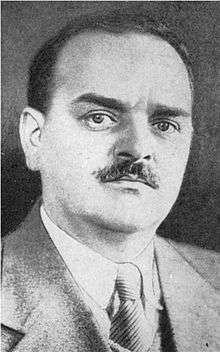 7 May] 1888 – 24 December 1970) was a Soviet politician and Chairman of the Presidium of the Supreme Soviet (or President of the USSR) from March 19, 1946 until March 15, 1953. 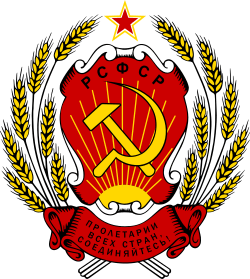 Though the titular Soviet head of state, Shvernik had, in fact, little power because the real authority lay with Joseph Stalin as General Secretary of the Communist Party of the Soviet Union. Following the death of Stalin, Shvernik was removed as titular president of the USSR and replaced by Kliment Voroshilov on March 15, 1953. Shvernik returned to his work as the chairman of the All-Union Central Council of Trade Unions. In 1956, after his work in the Pospelov Commission, which was the basis of Khrushchev's "Secret Speech" denouncing Stalinism, Khrushchev recommended Shvernik for the post of chairman of the Party Control Committee and later put him in charge of rehabilitating the victims of Stalin's purges (Shvernik Commission). In 1957, Shvernik again became a full member of the Presidium and remained on the body until he retired in 1966. ↑ "NEW MASS TRIAL IN MOSCOW". Aberdeen Journal. British Newspaper Archive. 2 March 1931. Retrieved 17 May 2015. (subscription required (help)).